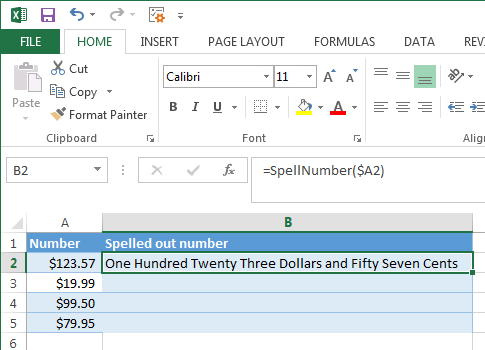 In this article I will show you two quick and free ways to convert currency numbers into English words in Excel 2016, 2013 and other versions. Microsoft Excel is a great program to calculate this and that. It was initially developed to process large data arrays. However, it also lets creating accounting records like invoices, evaluation or balance sheets quickly and effectively. In more or less solid payment documents it is necessary to duplicate numeric values with their word form. It is much harder to falsify typed numbers than those written by hand. Some swindler can try to make 8000 out of 3000, while it is almost impossible to secretly replace "three" with "eight". So what you need is not just convert numbers to words in Excel (е.g. 123.45 to "one hundred and twenty three, forty five"), but spell out dollars and cents (е.g. $29.95 as "twenty nine dollars and ninety nine cents" ), pounds and pence for GBP, euros and eurocents for EUR, etc. combinations, VBA macros, or third-party add-ins. Note. If you are looking for the number to text conversion, which means you want Excel to see your number as text, it's a bit different thing. Usually, you simply need to change the cell format in Excel (select your range with numbers, press Ctrl+1 on the Number tab, and select "Text" in the Category field). You can also use the formula =text(). Please find the details in the article Ways to convert numbers to text in Excel. As I have already mentioned, Microsoft didn't want to add a tool for this task. However, when they saw how many users needed it, they created and published the special VBA macro on their website. The macro does what its name SpellNumber suggests. All other macros I came across are based on the Microsoft code. You can find the macro mentioned as "spellnumber formula". However, it is not a formula, but a macro function, or to be more precise Excel User defined function (UDF). The spellnumber option is able to write dollars and cents. If you need a different currency, you can change "dollar" and "cent" with the name of your one. If you are not a VBA savvy guy, below you will find a copy of the code. If you still don't want or haven't time to sort this out, please use this solution. Open the workbook where you need to spell the numbers. Press Alt+F11 to open the Visual Basic editor window. If you have several books opened, check that the needed workbook is active using the list of projects in the upper left corner of the editor (one of the workbook elements is highlighted with blue). In the editor menu go to Insert-> Module. You should see a window named YourBook - Module1. Select all of the code in the frame below and paste it to this window. Press Ctrl+S to save the updated workbook. You will need to resave your workbook. When you try to save the workbook with a macro you'll get the message "The following features cannot be saved in macro-free workbook"
Click No. When you see a new dialog, chose the Save as option. 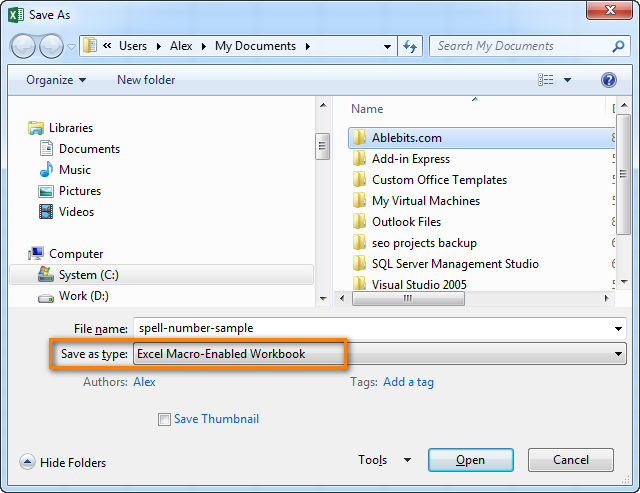 In the field "Save as type" pick the option "Excel macro-enabled workbook". 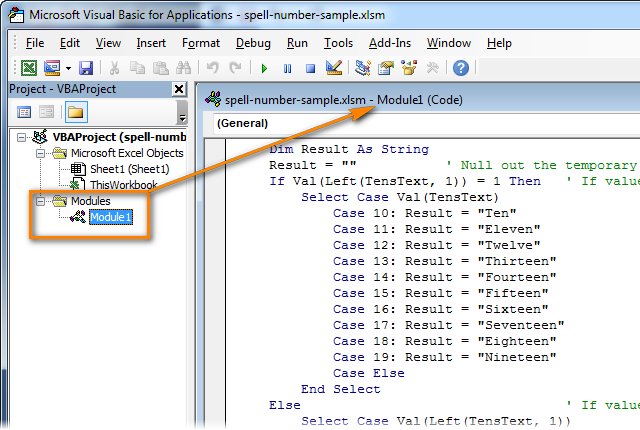 Now you can use the function SpellNumber in your Excel documents. Enter =SpellNumber(A2) into the cell where you need to get the number written in words. Here A2 is the address of the cell with the number or amount. Quickly copy the SpellNumber function to other cells. Note. Please keep in mind that if you use SpellNumber with a link to another cell, the written sum will be updated each time the number in the source cell is changed. You can also enter the number directly into the function, for example, =SpellNumber(29.95) (29.95 - without quotation marks and the Dollar sign). First off, you must know VBA to modify the code according to your needs. It is necessary to paste the code for each workbook, where you plan to change it. 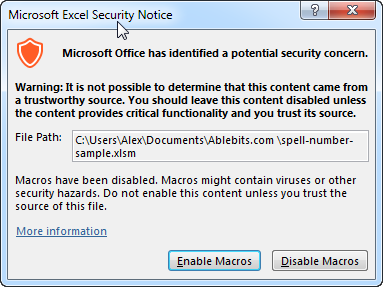 Otherwise, you will need to create a template file with macros and configure Excel to load this file at each start. The main disadvantage of using a macro is if you send the workbook to somebody else, this person will not see the text unless the macro is built into the workbook. And even if it's built-in, they will get an alert that there are macros in the workbook. Spells decimal point, each zero and the rest of the number as an integer. Feel free to explore its possibilities on the product's home page. The author states that it's tested and works in Excel for Windows 2000, 2002(XP), 2003, 2007, 2010 (32-bit), and 2013 (32-bit) in MSI-based and Click-To-Run installations of Office 365 cloud-based services. I hate to say that the add-in doesn't work with 64-bit versions of Excel 2010, 2013, 2007. And it is a considerable obstacle since these versions are becoming more and more popular. So lucky you are if you have Excel 32-bit :) Feel free to download the add-in and check it out. If you are the one with Excel 64-bit like me, drop the author a line and ask him for a special version. It appears that Excel MVP, Jerry Latham, created such Excel User defined function (UDF) as WordsToDigits. It converts English words back to number. You can download Jerry's WordsToDigits workbook to see the UDF code. Here you'll also find his examples of how to use the function. You can see how the function works on the sheet "Sample Entries", where you will also be able to enter your own examples. If you plan to employ WordsToDigits in your documents, please be informed that this function has restrictions. For example, it doesn't recognize fractions entered in words. You will find all the details on the "Information" sheet. 294 Responses to "Two best ways to convert numbers to words in Excel"
when i copy and paste this, it gives me errors, what am i doing wrong? replace lng mam yung dollars nang pesos (control+h) tapos replace all lng.. I am getting a value like this :Four Hundred Eighty Dollars and Seventy One Cents. Instead of Dollars I want to have it in Kuwaiti Dinars and fills. This formula is very good working on any Currency.. Thank you Sir for sharing this formula. It's help me a lot! I really appreciate that. Thanks again. help me naman po pano mag convert numbers to words sa excell for cheque please ..
Can you please help me tweak the VBA code to have this new result. How can I download vba code to my phone? i just want the wording not any currency. what should i do? Hi, can i have the code without dollars and cents, E.g. Thanks for authentic codes. It works where codes from Microsoft gave an error message.